Today we’d like to introduce you to Adam Bruene. Adam, can you briefly walk us through your story – how you started and how you got to where you are today. I graduated from U of I in 2004 with a Bachelor’s Degree in Political Science and Philosophy. My initial trajectory was law school. After my first year of law school I essentially realized that I didn’t want to be a lawyer. Now, I have many friends who are lawyers and good people, but I felt like a lot of lawyers are not primarily concerned with helping people, and helping people is what I wanted to do. So, I left law school and had a year of self-reflection to determine what I could do to help people. I thought, “well, who has helped me?” My chiropractor was someone on that list, so I asked him about chiropractic school. It turns out there’s a great one right over in Lombard (The National University of Health Sciences), I wouldn’t even have to move. So, I got a personal training certification, thinking that I could do that on the side while I was in school. Little did I know; chiropractic school is very much a place that trains physicians and I would have no time for much other than school. It was a challenge, but a welcome challenge because I found I had a talent for it. My wife was attending medical school at RUSH at the same time, so we had each other to study and lament with. I graduated in 2009. After school I started into practice, using what I had learned. About 2 years in, however, I hurt my back badly and the chiropractic that I was used to wasn’t helping. Months later I started towards my certification in McKenzie Diagnosis and Therapy (I am now certified), and was able to quickly use what I learned (even before actually taking a class, just from the introductory material sent out) to completely fix my injury. Further, the treatment I did to myself. That was a big eye opener to me that I could be doing better by my patients and could be teaching them how to treat themselves. I wanted even more options for self-directed or active treatments and found Dynamic Neuromuscular Stabilization (DNS) and even further improved my own health, as well as my ability to treat my patients. I began to realize that there was a better way to do things, so I started my own practice in late 2015 to try to re-invent the wheel and create an entirely new business model for chiropractic healthcare. Alright – so let’s talk business. Tell us about NeuroActive Health & Fitness – what should we know? NeuroActive Health and Fitness is essentially two businesses. NeuroActive Health is my chiropractic practice. The name is quite literal, in that I want there to be a focus on neurology (getting the brain to better control the body), and for the primary treatments to be active, meaning the patients do them themselves. My goal in starting my own practice was to really change the typical chiropractic business model. Many practices offer mostly passive therapies: A patient lies down and receives and adjustment, lies and receives electric stim, lies and receives some soft tissue therapy, then they come back 3 times a week. Without the constant treatment, not much changes necessarily long term, but by arming patients with strategies that they implement themselves, they have a blueprint for potentially permanent freedom from their pain. The neurologic strategies help recruit the power of the brain to change posture and movement patterns to limit or eliminate future injury. Chiropractors often concern themselves with joints and the soft tissues that move the joints, but not the role of the brain to dictate how those joints and tissues move (or don’t move). We don’t want to just look at the “what” is dysfunctional, but the “why” or cause of the dysfunction. Those same techniques have been organized into a fitness program, NeuroActive Fitness, so that people don’t need to be my patients to have access to those same neurological strategies that can prevent injury in the first place and/or improve athletic performance. They’re fitness classes taught by a physician, which is rare, and so they’re kind of like group therapy, but affordable and not so clinical. Classes are offered at our offices, but we also hold them at gyms, Pilates and yoga studios, and training centers around the city. We will travel to your gym, business, or work with your whole team where you train etc. It occurred to me that in my old practice, I sat around waiting for people to injure themselves, then they would come to me and I would help them to fix the injury, then I would teach them how to avoid that injury again in the future. Wouldn’t it make much more sense to teach people how to not get hurt in the first place? Our slogan is “Whatever you do…do it better” and we mean that in every way. I saw a way to do what I do better so I started the business. When it comes to athletes or people involved in sport or exercise, we mean that improving neurologic control of the body will allow you to “do it better.” We’re not trying to replace what anyone is already doing, if you love CrossFit, getting better control of your core and movement patters will help you lift more without hurting yourself. If you love running, having improved foot and hip mechanics will make your stride more efficient and keep you from torqueing your knee or developing Achilles pain. The neurological approach is based heavily on DNS or Dynamic Neuromuscular Stabilization. DNS, in short, works by accessing the pre-programmed “software” in the brain that gets babies upright and walking in early life. You can watch a normally developing baby and notice that they don’t bend at the back to pick something up, they don’t slouch, they don’t put their shoulders in compromised positions etc. They don’t learn it, it is inherent, and we can essentially boot back up that software in the brain to create better posture and movements not necessarily by strengthening muscles, but by influencing the brain to more appropriately control the posture and movements automatically. We look at it like this: people already have some strengthening program and they can stick with that, they probably have a mobility program and that’s likely fine. Those are the bricks, but the neurology is the mortar that holds them all together and makes them cohesive. Furthermore, DNS is increasingly being used at the highest levels of sport, Olympians, pro athletes etc., and NeuroActive Fitness is an affordable and accessible way for the average Joe to gain the same benefits. The Chicago Cubs athletic trainer implements it and shoulder injury in the pitching staff has gone down, Jaromir Jagr is still playing professional hockey at 45, largely because he rarely gets injured and he has been an early proponent of DNS. Roger Federer has been at the top of tennis for 2 decades because he moves so well he hardly ever gets hurt. It’s not a fluke. So, in an ideal world, everyone would be so stable from doing NeuroActive Fitness, there would be no need for NeuroActive Health, but until then we’ll try to offer as much as we can to everyone who could use it. As of right now, our entire organization is me, Dr. Adam Bruene, and my assistant and massage therapist Shelbi Fowler. 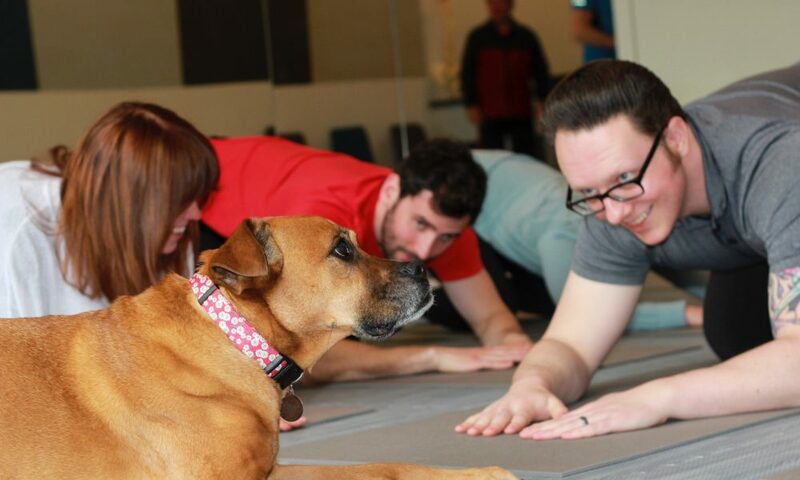 Shelbi also uses neurologic techniques with her soft tissue therapies (Neurokinetic Therapy, or NKT), which really integrates with aim of the practice. Similar to me, in her old practice she tired of just “rubbing where it hurts” and sought was to more permanently answer the question of “why” is this muscle always tight, rather than just releasing it and waiting for it to tighten up again. We’ve had a lot of help along the way as well. My parents, John and Linda Bruene have been awesome, helping in any way they could, including financially. My father helped with the build-out of the office, based on designs my father-in-law (Randy Howell) drew up. My brother, Jake, has helped with marketing ideas, my wife Julie, who is a sports medicine physician has put me in touch with people and other physicians to let them know about what we offer here. Her entire practice Midwest Orthopaedics at Rush, have been incredibly supportive. Shelbi came with me from a different practice and has had to work other jobs so that she can help build up the practice, she’s willing to do that because she believes we’re working towards a better way to practice and help people. My friend Laura Bomkamp found our office space for us. A friend and talented local artist, Remy Glock, painted our slogan on the wall of the office. Lots of mentors along the way, but I have to mention Pavel Kolar, for organizing the neurologic principles of DNS, which is the backbone of the practice. I’m so proud of you Adam, you’ve done a wonderful job at everything you’ve ever attempted. Keep up the tremendous work.